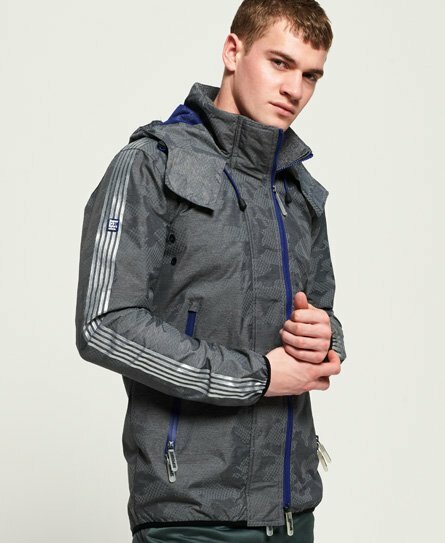 Superdry men's Technical camo SD-Windsprinter. Perfect for wearing to and from the gym, this jacket features a bungee cord adjustable hood, double layer zip fastening, and ventilation detailing under the arms. The windsprinter also features two zipped front pockets, an inside pocket with popper fastening and hook and loop fastened collar. The jacket has been completed with stripe detailing down the sleeves, a logo graphic on the collar and and reflective detailing on the hood and back.